Brazilian Voices has determined to expand the reach of their music through a humanistic venture called the Brazilian Voices Arts & Healing Program, wherein Brazilian Voices singers bring soothing Bossa Nova and Samba to individuals and groups outside of the theatre for healing purposes. The Arts and Healing team of singers have taken their live music to medical centers, non-profit health-related support organizations, and facilities serving the elderly. Through this project, the singers of Brazilian Voices have demonstrated repeatedly what empirical research has previously documented: namely, the healing power of music. The Arts & Healing team performs regularly at many varied institutions all over the South Florida area. These include hospitals, hospices, non-profit organizations, and universities, among others. More details about performances and locations can be found in our A&H Highlights section. The Brazilian Voices Arts & Healing Program was inspired and guided by the work of Wellington Nogueira, founder of Doutores da Alegria (Doctors of Joy), a non-profit organization recognized nationwide for its professionalism and innovative work in the fields of Performing Arts, Culture and Health. Brazilian Voices developed and implemented their own community-based program in Florida with the mission of bringing community participation and personal well-being through the Arts. Research has shown that music enhances the ability of both mind and body to deal with life stressors in a more positive way, particularly through the human voice and its natural ability to affect us. This is the ultimate goal of the Arts & Healing Program, which implements its mission through a series of monthly workshops and performances, fostering a greater sense of community participation, hope and joy. Brazilian Voices is keenly aware of their responsibilities and ethical conduct. 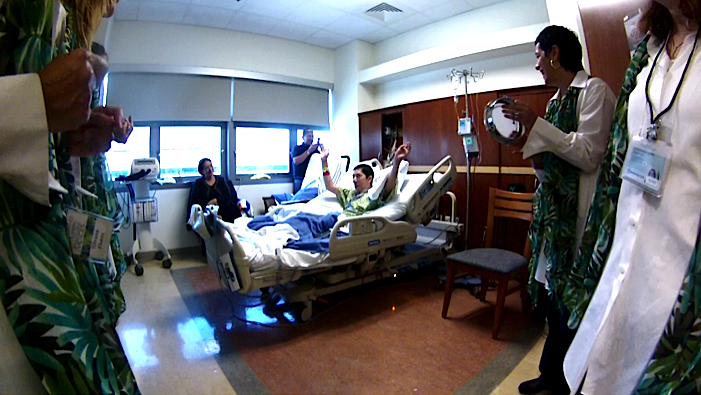 The Arts & Healing team works in cooperation with the healthcare staff with whom they interact and who shares in the pleasure and enthusiasm of the performers. The group also works on developing and broadening their repertoire and the different elements of music, such as harmony, rhythm, dynamics, timbre, etc. Additionally, the Arts and Healing program offers a series of workshops designed to support and enhance the Arts and Healing Program’s shared goals. Such workshops intend to further explore, understand and experience the nature of their work. These workshops include the implementation of drama techniques with singer participation, real-life simulations, group dialogue on the latest research— drawn upon a wide variety of sources on the positive effects of music and sound— its applications, and their effect upon the listener. “A real medicine can only exist when it penetrates into a knowledge which embraces the human being in respect to body, soul and spirit.” Rudolf Steiner. For further information, please contact Marize Casaes through our contact form. Isabel has been a software developer for several years. She’s a Math and Computer Science graduate and speaks English, French and Portuguese fluently. She has been working for the healthcare industry for quite a while. The company she currently works for is highly engaged in community services and fully supports her volunteer activities. She joined Brazilian Voices in 2007 and soon after the Arts & Healing team. Today Isabel coordinates the Arts & Healing program along with Coordinator Marize Casaes. Marize Casaes has a degree in Business Administration. Born in Rio de Janeiro, Brazil, she moved to Florida with her family in 2000. Attracted by Psychology and Integrative Therapies, she graduated and practiced in Naturopathy – a discipline that encompasses the knowledge of Acupuncture, Herbal Therapy and Aromatherapy. While still in Brazil, she established her career in those fields and, along with a group of Psychologists, developed a multidisciplinary team where her expertise could be applied towards psychological counseling. Believing that artistic expression, especially music, is a powerful tool in the therapeutic and self-healing processes, as Co-Coordinator of Arts and Healing Program, she found the ideal opportunity to practice and expand her skills.